Scientific American says the theory of human evolution needs revision. 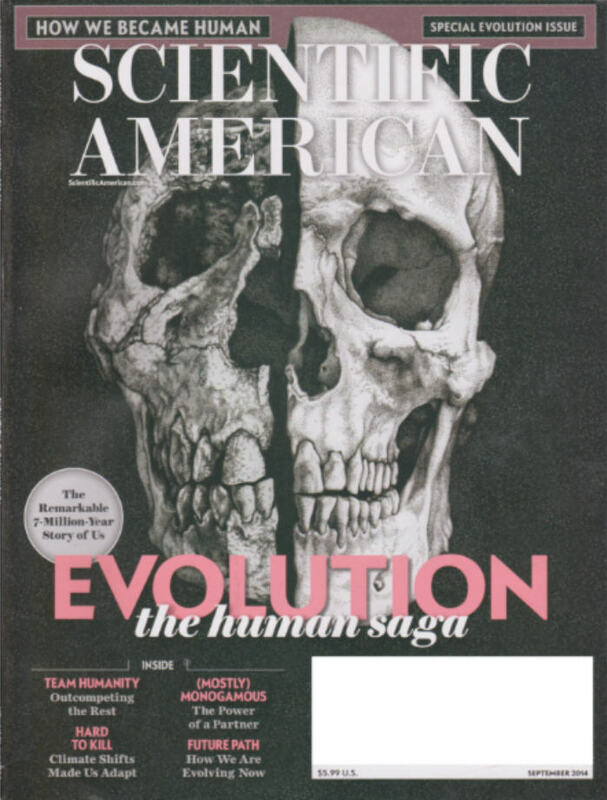 The cover of this month’s issue of Scientific American promised to be a “special evolution issue” about “Evolution, the human saga,” which tells “the remarkable 7-million-year story of us.” We strongly encourage you to run right out and buy the issue because it basically says that practically everything ever written about human evolution in the past is wrong. The whole issue is a gold mine of admitted evolutionary mistakes, too many to include in our “six-page newsletter” (which is eight pages this month), so we will have to settle with sharing a few summary statements. Notice that the “scientific” account of human origins is actually a “story.” Furthermore, it is a historic fact that the story keeps changing, because the story has always been wrong. So, what do evolutionists believe now about human evolution? Honestly, it is hard to say because their theories are so confusing and inconsistent; and we don’t want to be accused of misrepresenting what they believe. Scientific American published a diagram of the human evolutionary tree on pages 40 and 41 of their special evolution issue, but it looks more like a pile of broken branches lying on the ground than a tree. The fact that this tree doesn’t look like previous trees is not new. We published a comparison of the various speculative human trees more than a decade ago, 3 which you may wish to review. Of particular note is that Scientific American’s September 2014 tree shows Homo rudolfensis, Homo habilis, Homo ergaster, and Homo erectus as separate species. Last November, the scientific consensus seemed to be that they were all one species, based on the analysis of Skull 5. 4 Does Scientific American not agree with the consensus, or has the consensus changed? We don’t want to sound like we are complaining; but it makes it really hard for us to write about what evolutionists believe about human evolution when they keep changing their minds. It would make our life so much easier if they would just pick one lie and stick with it! Unfortunately, Scientific American says we aren’t going to get a consistent story for decades. Tracing the evolutionary ancestors of Homo sapiens was once thought to be a relatively straightforward matter: Australopithecus begat Homo erectus, which begat Neandertals, which begat us. Over the past 40 years fossil finds from East Africa, among other things, have completely shattered that hypothesis. Keeping paleontologists busy for decades is really all that matters, isn’t it? We would not want them to be unemployed! But paleontologists construct evolutionary histories based on similarly shaped jaws or teeth all the time! Despite the fact that there isn’t any real evidence that evolution actually happened, that doesn’t stop paleontologists from speculating about how it happened. Or, did climate change actually have nothing to do with it? Did intellectual challenges force us to evolve instead? The comment about human evolution being unusually rapid refers back to the previous point in the article that the presumed rate of evolutionary change in human beings isn’t consistent with the presumed rate of evolutionary change in other animals—but let’s not let that distract us from the notion that making tools caused us to evolve. How did that happen? If animal fats are so much better for the brain than vegetables, why is Michelle Obama trying to get school lunch programs to cut out pizza and hamburgers, and serve more vegetables instead? Doesn’t she want our brains to evolve even more? But seriously, it was war that really caused us to evolve! Or, maybe it was social cooperation, not war, which caused us to evolve. The traditional explanation of rapid brain development in hominins, favored by evolutionary psychologists, is known as gene-culture coevolution. This process involves the steady operation of natural selection on successive generations of individuals, with powerful positive feedback between innovation in the biological and cultural spheres. The “more to it” is “chance.” We just evolved by accident, without any cause at all. Ian Tattersall ends his article with a semi-religious observation. When I was a child, I had a dog that was left in our basement for what we thought was going to be a short time. Unfortunately, our family was unavoidably delayed for a very long time. When we returned, we discovered him cowering in a corner because he could not hold it any more and had answered the call of nature. He knew it was wrong to defecate there, and he accepted responsibility for his choice. At least one species other than humans makes choices and accepts responsibility for those choices, so Tattersall is factually wrong on that point. Evolutionists are in the difficult position of trying to have it both ways. On one hand, evolutionists generally want to claim that humans are just animals, no different from any other animal. On the other hand, they have to acknowledge that we really are different from animals. The final section addresses the question, “Where Are We Going?” It is just a lot of speculation about how we will evolve in the future. If one doesn’t know how evolution worked in the past, how can one possibly know what it will do in the future? Just because a scientist says something is going to happen doesn’t mean it will actually happen. We don’t dispute the value in pondering what the future might hold, and how one might prepare to meet that eventuality. We only dispute the value of basing those thoughts on something that didn’t really happen in the past. If the premise is wrong, the conclusion can only be right by accident. The theories of evolution in general, and human evolution in particular, are theories that Leonardo da Vinci would say, “begin and end in the mind.” Leonardo was one of the greatest scientists of all time. He knew what true science is. Here is what he said about true science. It isn’t “anti-science” to be against the theory of evolution because the theory of evolution isn’t scientific. Science is against evolution. 14 Leonardo da Vinci quoted by Carlo Pedretti, Leonardo Art and Science, TAJ Books, 2004, page 168.